Credit: Electron microscope image by Horst Neve, Max Rubner Institute, Kiel, Germany. The human intestinal tract contains hundreds of different microorganisms and the intestinal flora form a complex society with many billions of cells. Changes and imbalance in the intestinal flora is important for the development of, for example, obesity and diabetes. Therefore, there is great interest in understanding what affects the intestinal flora and how you can change it. Bacteriophages (also called phages) are viruses that attack bacteria (see below). There is a growing understanding that phages play an important role in the composition of our intestinal flora. The hypothesis of the researchers is that the phages can be actively used to manipulate the composition of the intestinal flora and thus prevent obesity and that a deeper understanding of the phage-bacteria interactions will lead to new, effective ways to control our intestinal flora. "In the research project PhageGut we will attempt to use lytic phages to shape the composition of the intestinal flora as an alternative to trying to change it through diet, antibiotics or surgery. And we will do it in a way that is very targeted, so we do not affect the intestinal flora's good bacteria," says Associate Professor at the Department of Food Science at the University of Copenhagen, Dennis Sandris Nielsen. A library of phages and their associated bacterial hosts. In practical terms, the researchers will isolate the most important phages from the intestinal flora in mice. "In order to isolate a phage, you have to know which bacteria it attacks. Therefore, we need to get hold of the university's strain collections and also cultivate some of the most important members of the intestinal flora of the mouse," explains Dennis Sandris Nielsen. The next step is to purify the total population of phages from the intestinal flora in a number of mice. Once this is done, the researchers can put a blanket of phages on top of a blanket of the mouse's intestinal flora bacteria to see where holes arise. A hole (a so-called "plaque") in the blanket of bacteria means that a lytic phage has attacked the bacteria and killed them. When the researchers find a plaque, they can purify the plaque, characterise it and thus determine which phage has attacked which bacterium. "So we end up with a library of a lot of bacterial hosts and the corresponding phages," says Dennis Sandris Nielsen. The library of phages is then used to carry out targeted manipulation of the intestinal flora in mice – which are predisposed to develop obesity – in a positive direction. "Our hypothesis is that we can thus prevent the mice from developing obesity. We will also examine whether phages can be used to introduce health-promoting "probiotic" bacteria into the gut with greater success than is possible today," says Dennis Sandris Nielsen. If the research with the mice can be transferred to humans, it has the potential for preventing obesity as well as other diseases that seem to be associated with an imbalance in the intestinal flora early in life, including asthma and allergies. "If you imagine a newborn child with a family history of allergies, obesity or diabetes, it might make sense to screen for certain imbalances in the intestinal flora that may predispose the child to diseases later in life – and here targeted treatment with phages could possibly be used to push the intestinal flora in a positive direction," says Dennis Sandris Nielsen, who emphasises that this is only a potential future scenario. "We are at a very early stage and we will start by working with mice, which live in a much more uniform environment than humans. But this is certainly a promising project," says Dennis Sandris Nielsen. 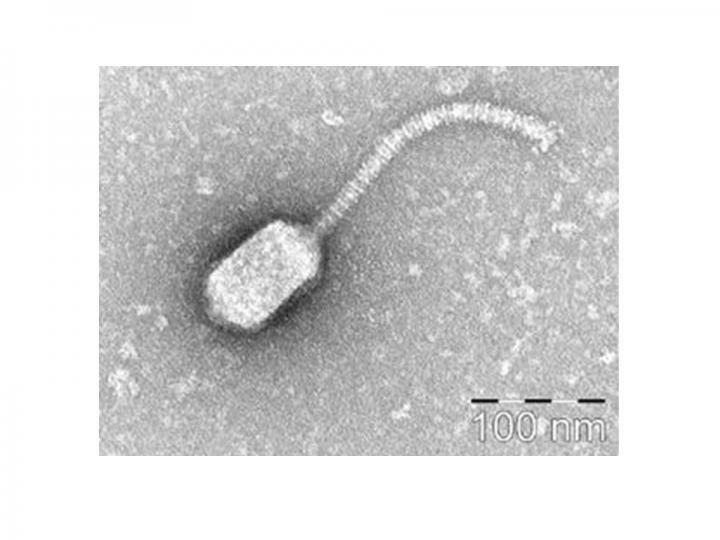 The classic lytic phage that attacks by shooting its genetic material into bacteria. It thus takes over the machinery of the bacterium to make new viruses. The bacterial shell that has now been taken over by the phage will explode and send out a lot of new phages into surrounding area, which can then attack new bacteria. The temperate phage also attacks by shooting its genetic material into bacteria. But instead of immediately taking over the bacterium, the phage integrates its genetic material into the bacterial genome. When the bacterium divides, the genetic material of the temperate phage is also shared and a complete copy of its genetic material is passed over into the bacterial daughter cells. This can be beneficial for the bacteria, as the phage protects it from attacks from other phages. As the cell division continues, more and more bacteria will have the phage's DNA. If the bacteria carrying the temperate phages are exposed to different types of stress, the phages can enter into a lytic stage and kill the host bacteria. The Danish Council for Independent Research has awarded 6,293,061 DKK (app 1 million USD) to the PhageGut project, which will run for three years starting on 1 October 2016. The project is led by Associate Professor Dennis Sandris Nielsen, Department of Food Science (FOOD), University of Copenhagen, Denmark. Other participants include Associate Professor Finn Kvist Vogensen and Head of Department Bjarke Bak Christensen from FOOD.